Although we touch upon the subject of Matcha and the Matcha caffeine levels in the various articles at the site; we wanted to devote just a short article specifically on the caffeine in matcha. Because Matcha is made from crushed whole tea leaves, the caffeine content is somewhat higher than that of bagged tea. In fact, the Matcha caffeine levels can actually equal half the level of a black cup of coffee. When comparing Matcha's caffeine to steeped green tea you receive 31.8 mg caffeine in regular green tea and 68mg of caffeine in Ceremonial Matcha. Keep in mind, caffeine isn't bad for you in moderate amounts and is actually beneficial in the form of Matcha. It's a mild stimulant that naturally occurs in a variety of plants, beans, fruits and nuts. The caffeine in Matcha actually can help to boost your metabolism by as much as 40%, while helping to regulate blood sugar levels. Matcha green tea is prepared as a powder and whisked into hot water, a method which releases the caffeine into the body gradually over 6-8 hours. Swapping regular tea or coffee for Matcha green tea lattes will result in sustained energy and increased focus without giving you the shakes or a caffeine crash later in the day. Due to Matcha's combination of phyto-nutrients, the caffeine in Matcha is assimilated in a very different and much healthier way, than coffee or black tea. The caffeine in Matcha binds to the larger catechin molecules, that also act as powerful antioxidants, and is released into the bloodstream slowly over time, as the catechins are broken down and assimilated. 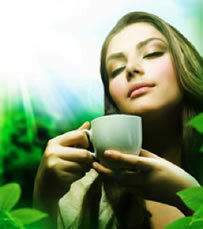 The result is a slow dissemination of caffeine that provides sustained energy for up to 6 to 8 hours. This synergy within Matcha also prevents the insulin and adrenalin spikes typical for coffee intake, so you never have to experience the "crash" that follows when your blood sugar drops. Truly the healthiest energy drink! • 2 tsp to 1 tablespoon serving (for the equivalent of a 12 to 16 oz mug) will give you 38-54mg of caffeine. • If you have a smaller portion, (8 to 12oz) cup of Matcha Chai, then you will use probably 1 1 /2 tsp, which would give you around 28mg of caffeine. Our Matcha tea blends give you all of the great matcha benefits, with the sublime flavor and benefits of our spices and Coconut Nectar Sugar..the most satisfying matcha latte experience!